Brenda Chapman held a very successful launch of Where Trouble Leads at Whispers in Ottawa on Sunday afternoon, May 27th. Friends, family and neighbours all dropped by for a signed copy of the latest in the Jennifer Bannon mystery series. 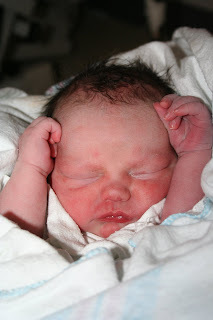 Congratulations to lian goodall and her husband on the birth of their son, Amzie! Peggy Dymond Leavey on the move! Peggy Dymond Leavey was one of six authors and illustrators conducting workshops at the MASC Young Authors' & Illustrators' Conference, April 25-27 in Ottawa. A total of 660 children attended the three-day event. Peggy says that the enthusiasm of these eager students, hand-picked from Grades 4-8 in schools in Ontario and Quebec, was infectious. It was an amazing experience. On May 2, Peggy visited students in Grades 4-8 at Sacred Heart Catholic School in Batawa, ON. She read, for the first time, from her new novel, "Treasure at Turtle Lake". With her book, "The Path through the Trees," nominated for the 2007 Silver Birch Award, Peggy will be attending Silver Birch celebrations in Durham region (May 16), Peel (May 23) and East York (May 25). She will also be at Harbourfront Centre on May 17 for the grand finale, which marks the conclusion of The Forest of Reading Programs for this year. 4000 school children from Grades K-12 are expected to attend the daylong festival. 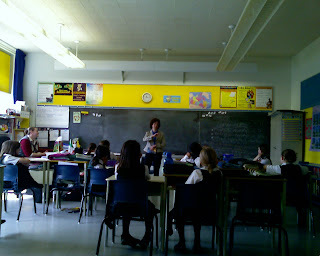 Napoleon author Brenda Chapman gives a book talk to Mrs. Jones' grade five class at Joan of Arc School in Ottawa, Ontario, April 25, 2007.